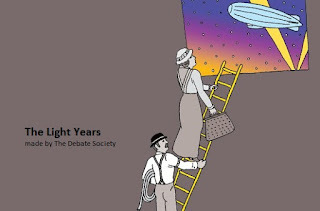 A brief note about The Light Years, created by The Debate Society and being presented at Playwrights Horizons. This play, though engaging enough throughout, didn't elicit a strong reaction from. (Based on the tepid applause at the end of the performance, I wonder if my fellow audience members felt the same way.) It is clear that this tale of two families chasing dreams, 40 years apart, was created out of and with passion, and there is a sense of romance to the overall story arc. (A few details about that below.) Yet I think what kept me engaged throughout the performance was the desire and hope that there would be something to engage with, something potent, some kind of pay off. That pay off never came. The action of The Light Years is centered around the 1893 Chicago World Fair and the subsequent 1933 edition. In 1893, Steele MacKaye (Rocco Sisto) a renaissance man with an entrepreneurial spirit, dared to harness the power of the new utility, electricity. The centerpiece of his 12,000-seat spectatorium would be a mobile moon, studded with dozens upon dozens of light bulbs. Hillary (Erik Lochtefeld) is the head electrician, and he works hard to deliver a lunar thrill. (Hillary is aided by Hong Sling (Brian Lee Huynh).) His wife, Adeline (Aya Cash (You're the Worst)), is taken with his romanticism, as well as the fanfare of the fair. They live comfortably. In 1933, Ruth (also Cash) has just moved into the home once occupied by Hill and Adeline with her husband, Lou (Ken Barnett), a struggling musician, and their son, Charlie (Graydon Peter Yosowitz), in tow. They find it difficult to make ends meet. I suppose we're meant to be enchanted by the journey the families take, noticing the way it can take light years (get it?) to complete something, and the connection between the two families. Scenic designer Laura Jellinek and lighting designer Russell H. Champa had palpable success showing us the constellations Hill worked to create in the theatre, and there were nice performances throughout, particularly from Cash, Lochtefeld, and Barnett, all of which added value to the performance. But it just didn't grab me. 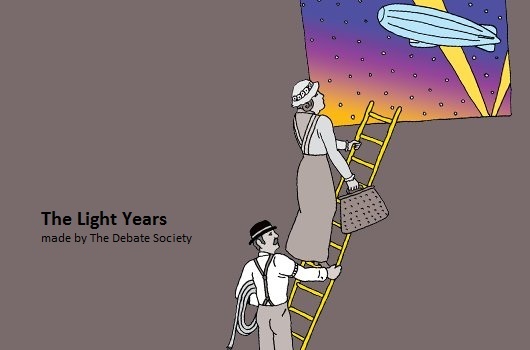 The Light Years was made by The Debate Society. Specific writing credit goes to Hannah Bos and Paul Thureen, and Oliver Butler developed and directed the show. Original music is by Daniel Kluger.